At the end of the year, people get excited with hope for the New Year, but there are still many who have to endure hard times with sighs and tears. Numerous people in the global village are suffering from all sorts of disasters; they even worry about where to sleep tonight and what to eat tomorrow, not to speak of the New Year. Last November, Super Typhoon Haiyan hit the central Philippines and left nearly 10,000 people dead or missing. The victims, who lost their families and friends and barely survived, cannot even afford the basic necessities of life such as food, clothing, and shelter. In Bangladesh, numerous people are losing their livelihoods due to climate disasters like tropical rainfall and flooding at every rainy season. In Korea as well, there are many people around us who need help such as children who suffer from rare diseases and their parents who worry about how to manage huge medical bills, multicultural families who suffer from the double torture of poverty and cultural conflicts, and so on. There is only one thing that those people who spend colder winter nights really need; that is love. The Intl. WeLoveU Foundation has been conveying love to the whole world with the heart of a mother every year. 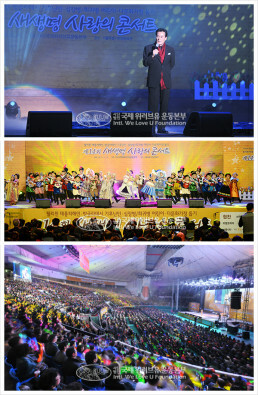 On December 15, about two weeks before the New Year’s Day, the Foundation held the 14th New Life Concert at the Jamsil Student Gymnasium in Seoul, Korea, to give love and hope to neighbors in need both inside and outside Korea—victims of Typhoon Haiyan in the Philippines, climate refugees in Bangladesh, children with heart or rare diseases, and multicultural families, etc. Even though the cold wave lingered for many successive days, it could not cool down the fervor of love. 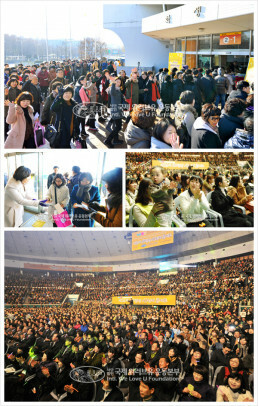 More than 6,000 participants filled the gymnasium. Chairwoman Zahng Gil-jah, Executive Director Lee Gang-min, Sponsor Chairman Lee Sun-jae, and President Lee Bae-keun of the Korea Association for Prevention of Child Abuse and Neglect (KAPCAN) graced the concert with their presence. Diplomats residing in Korea such as Tunisian Ambassador Mohamed Ali Nafti and Czech Deputy Head of Mission Jana Chaloupková and people from all walks of life like politics, economics, sports, culture, and media attended the concert and sent the message of hope to neighbors in need all around the global village. Around 4 p.m., before the concert began, Chairwoman Zahng Gil-jah explained that the main purpose of the concert was to give hope and courage with songs of love to neighbors in the world who had spent a tough year with broken hearts due to all sorts of diseases and disasters such as Super Typhoon Haiyan that devastated the Philippines, floods, earthquakes, droughts, heat waves, blizzards, tornadoes, and so on. She also expressed gratitude to everyone who had been putting forth efforts to convey love to those in need every year. “Next year, let’s do volunteer work more diligently with a deeper and greater love,” Sponsor Chairman Lee Soon-jae delivered his well-wishing remarks to the members of the Intl. WeLoveU Foundation and encouraged them. 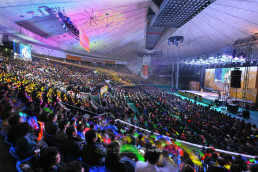 “It’s already 14 years since the New Life Concert was first held at the Jeongdong Event Hall in Seoul. The Intl. 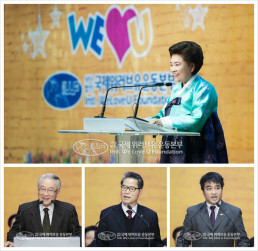 WeLoveU Foundation has been able to extend a helping hand to people all over the world beyond Korea, because each and every one of you has been continuously carrying out volunteer work,” President of KAPCAN Lee Bae-keun expressed his respect and gratitude to Chairwoman Zahng Gil-jah and the members of the Intl. WeLoveU Foundation when he delivered his congratulatory address. “The Philippines is a brother country of Korea since it sent soldiers to South Korea during the Korean War,” said First Secretary and Consul Roderico C. Atienza from the Embassy of the Philippines who attended the concert as representative of his country in his congratulatory address. He expressed his thanks to the members of the Intl. WeLoveU Foundation for making a united effort to help the people of his country who were suffering from Typhoon Haiyan and asked for their continuing interest and support. 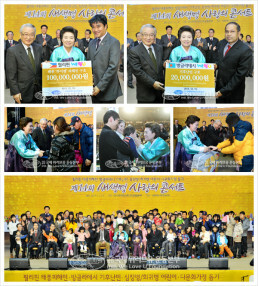 After his congratulatory address, the donation ceremony was held. The Typhoon Haiyan relief fund for the Philippines and the disaster relief fund to help climate refugees in Bangladesh were delivered to each embassy. Then donations and gifts were presented to thirty-six beneficiaries including multicultural families suffering from economic difficulties and cultural differences, and children with heart or rare diseases. Chairwoman Zahng Gil-jah and Sponsor Chairman Lee Soon-jae encouraged each of the beneficiaries and expressed their wish that they would all overcome difficulties and restore a happy, healthy life. The audience also gave them a cheer and a big round of applause with one mind. After the donation ceremony, the concert started with witty remarks from Kim Seong-hwan, PR Ambassador of the Intl. WeLoveU Foundation and an actor. The New Life Children’s Choir performed at the opening stage of the concert. The little angels’ lovely performance was followed by some veteran and new singers. “We came to deliver love to you through good music as musicians,” they said. The audience responded with thunderous applause and cheers. The concert continued for two hours, full of love and emotion. For the grand finale, all the performances and the audience sang the song, “We Love You” together. During the concert, the beneficiaries seemed to have forgotten their worries and sorrow. “I’ve never seen such a warm, loving place like this. I feel like I’m home. I was so busy taking care of my sick child that I didn’t have time to relax. Today, I’m very happy to receive such a friendly and heartwarming welcome. Since I’ve received the warmth of love, I think I’ll spend a warm winter this year,” said a Kazakhstani mother whose seven-year-old son was suffering from leukoplakia, smiling with tears in her eyes. “I’ve gained great hope, for many people contributed to relief funds for my home country and helped my family, too. In a harsh and difficult situation like a cold winter, I felt a warm heart like the blanket I received today. This experience gave my children and me the opportunity to think about doing volunteer work someday later,” said a pleased Filipino mother raising her three children alone. The eyes of the beneficiaries who gained hope and courage showed a strong will to live. “We felt great because we were able to give love and courage to people in need. It was also touching to see them regain smiles, which gave us energy as well,” said the excited audience in unison as they were leaving the concert hall. “It’s not easy for one person to help many. I’m very impressed to see people from all walks of life extend a helping hand to overseas countries as well as their own country with one mind, with the heart of a mother,” said the president of a local volunteer organization for the disabled, hoping to support the concert by attending it next year, too. The eventful year of 2013 is coming to an end and the New Year is approaching. In the New Year, too, though we begin it with hope now, there will probably be a series of problems and difficulties. It is impossible to stop all those troubles with human power, but love enables us to overcome any crisis. The members of the Intl. WeLoveU Foundation, who have been delivering love with the heart of a mother, will constantly share love with neighbors in need and make an ongoing effort to create the precious miracle of new life and hope.